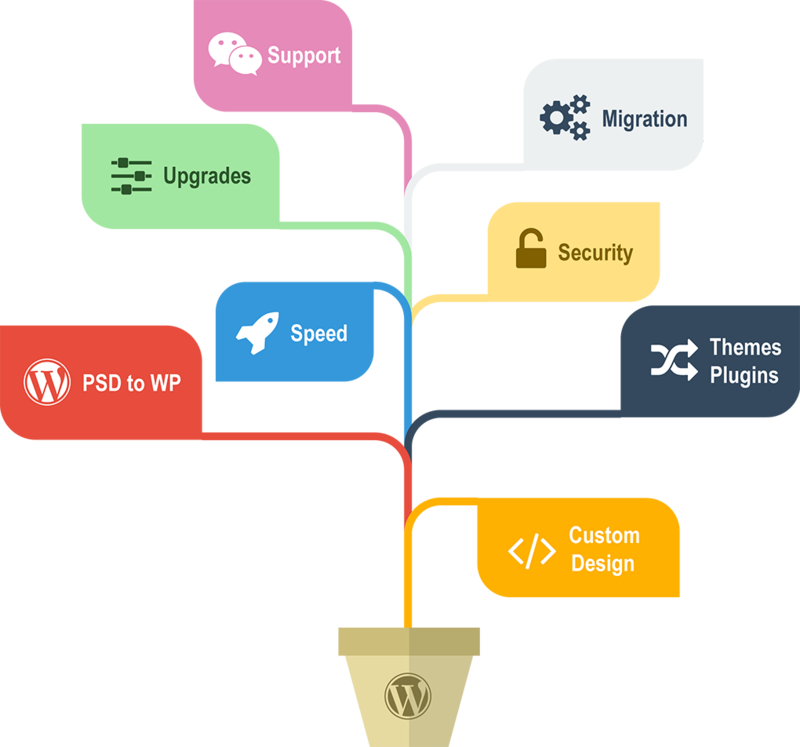 My WordPress migration services help you migrate your existing website to WordPress. A professionally built and well configured WordPress setup ensures that your new website is effective and takes on the load running. I build WordPress sites to deploy your custom tailored designs. It allows you to make a unique impression and stand apart on the web. I only build on premium frameworks such as Hybrid Core (robustly coded by Justin Tadlock, a member of WordPress’s theme review theme) or Genesis. My custom plugins and themes allow you to avail plugins and themes built from the ground-up keeping your business requirements as a primary goal. If you already have a design as a Photoshop PSD file, I’ll convert it into a fully-functional WordPress theme. It will be responsive so that it adapts beautifully to various viewports and retina-ready for hi-dpi displays. Sites that I build are delivered, setup and ready to launch on your production server. These are end-to-end turnkey solutions and you can go-live at the click of a button. An effective site loads fast. I’ll configure WordPress caching tweaked for your specific site requirements. If you have a VPS or a dedicated server I’ll also tweak the server-side to ensure that your website is blazing fast and has impressive page-load-times. The official WordPress disclaimer is “The upgrade process will affect all files and folders included in the main WordPress installation. This includes all the core files used to run WordPress. If you have made any modifications to those files, your changes will be lost… Before you get started, it’s a good idea to back up your website.” If that sends you into a tizzy or if you have a business website that warrants professional fault-proof upgrading, my expertise comes in handy. Before touching a thing, I’d make a foolproof backup of your current site, methodically upgrade one thing at a time and ensure that everything just sings. As important as it is to keep your site updated with latest content and for look and feel, it is equally important to focus on the security of your WordPress website against malicious hackers and malwares. Just give it a thought…Keeping your WordPress website bulletproof is your primary responsibility. Get a security audit done from time to time and follow the steps required to harden your WordPress website so that at the end of the day, you own a website that wonderfully helps you in growing your business by leaps and bounds. WordPress websites need minimal ongoing maintenance and support. But when it needs one, it is better to rely on a seasoned WordPress developer; someone who knows WordPress in and out. WordPress is rapidly developing and evolving to keep up with latest technologies and we at Convertica keenly review each and every update released by WordPress to make sure all our website solutions and themes and plugins benefit from it. So it be updating your existing website for performance issues or to just add that nifty little opt-in form, we can help you with anything and everything WordPress. With me as a WordPress consultant, you are in the safe hands.